Frost in forecast: Swath now or leave it standing? 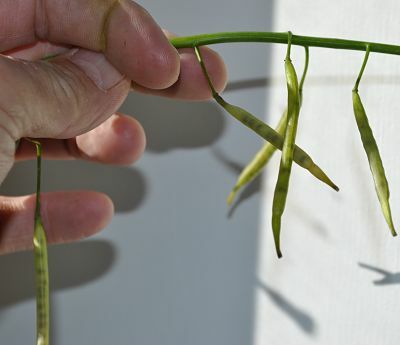 Pods turning translucent is a sign of heavy frost damage. With light frost in the forecast, crop left standing will still have a chance to mature further and yield more. Research conducted by the Canola Council of Canada over approximately 28 site-years indicates that significant yield increases could be achieved by swathing at 60-70% seed colour change (SCC). Swathing at 60% SCC resulted in 8% more yield (which was equivalent to about 3 bu./ac.) than at 30-40% SCC, 12% more yield than at 10-20% SCC, and 19% more yield than swathing before 10% SCC. A heavy frost will lock in high green counts and likely increase yield loss with pod splitting and pod drop. Swathing before the heavy frost event may prevent this green lock, but the crop needs to dry down to a seed moisture level of 20% or less. This can take 3 good drying days, so swathing has to occur at least 3 days before the frost to achieve this benefit. If the crop is very green, growers may want to take a chance that the heavy frost isn’t going to be as bad as forecast and leave the crop standing. —If frost is forecast for several nights in a row, canola with a high percentage of green immature seed might not have much chance to mature further. Growers could cut the crop and accept that any yield potential from immature seed is likely lost. —If growers still have a lot of canola to swath, they may need all the swathing days they can get. If today is a good day to swath, then go swathing but know that any yield potential from immature seed will likely be lost. Check for signs of physiological maturity in the green seeds to help assess how significant those losses could be.